Have you seen our new THG Shop? the best work by some of the most exciting South West artists and makers, including stunning ceramics by Trevor Lillistone, Boop Design’s contemporary porcelain bottle vases and Kay Morgan's quirky, colourful and affordable jewellery. a stunning range of prints for sale through our collaboration with the Double Elephant Print Workshop, Exeter. a wide range of art greetings cards, artists' postcards, Tate gallery books and kids' craft and colouring sets - perfect pocket money gifts. exhibition ranges linking to or inspired by each exhibition. Enjoy a hot or cold drink surrounded by Thelma Hulbert artworks and the best of South West craft. Visitors purchasing refreshments can also take advantage of our free WIFI. Kay Morgan enjoys experimenting with colour and shapes. 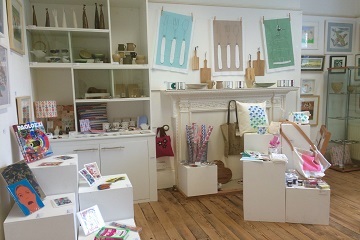 All her products are handmade by herself at home in Bristol. Every piece is cut and assembled by hand creating unique, individual yet affordable, colourful leather jewellery. Kiran Ravilious uses traditional lino printmaking techniques to produce unique and vibrant hand printed designs on stationery. Each design is hand-carved and printed by her in her studio in the uk. Trevor Lillistone is a ceramic artist who crafts contemporary, hand thrown stoneware and porcelain. The range includes bowls, jugs, tea bowls, espresso cups, coffee cups and mugs.